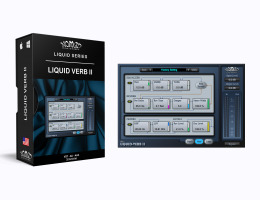 The Liquid Verb II Digital Reverb is a great professional reverb for music and post-production applications. From spacious concert halls to small rooms, the Liquid Verb II delivers professional-quality reverb and ambience processing to the most demanding studio sessions. Designed to be musical, the Liquid Verb II is easy to use with just a few controls and a simple modern interface. Three band equalizer with Pre/Post reverberation. HP and LP Filters section (post reverberation). Wet and Dry level controls. Input and Output level controls.